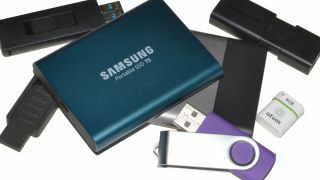 Take your files on the go and maintain their safe passage, as well as their speedy transfer, with one of the best portable storage drives for PC. well, everything else, on the go, one of the best portable storage drives for PC are perfect solutions. More broadly, they also offer a reliable and great way for general flexibility and portability. And aside from installing another drive in your rig, nabbing one of the best portable storage drives for PC can be a very worthy addition to your arsenal of gear, extending their use being straight-up portability and helping beef out your setup generally. Some of the best portables of really recent times may well utilise the faster USB Type-C or Thunderbolt 3 connections now, which means they are almost certainly more desirable (though the traditional USB interfaces still abound, for sure). USB-Cs can facilitate speeds that can basically match those of internal drives, and alongside that, they are getting cheaper and cheaper—thus, bargains and impulse purchase-worthy items are increasingly common. We know that choosing one of the best portable storage drives is a bit subjective and also not that easy given the abundance of portable storage drives available now, especially when so many claim to be the best. However, to try and sort some wheat from some chaff, here are our top picks for the best in three broad categories (in this order): best portable SSD; best rugged portable drive; and best high-capacity portable drive. If you're looking for a smaller drive, check out the best USB flash drives. This is the best portable SSD in our eyes. For the power user who wants it all—speed, capacity, and portability—and is willing to pay a premium for it, Samsung’s Portable SSD T5 is one of the slickest solutions out there. It’s faster than any USB flash drive available, it has the capacity of a hard drive, and you can carry it inconspicuously in your pocket. This spunky little drive shares the same DNA as Samsung’s 850 Evo SSD, just in a smaller package. It has a USB 3.1 Type-C connector, upgraded now to Gen 2, giving a maximum theoretical throughput of 10Gbps. We pitted it against a 512GB Samsung SM951 NVMe SSD connected over Gigabit Ethernet. The T5 ran the table in all eight CrystalDiskMark benchmarks and proved significantly faster in reading and writing game files and large files. Speed doesn’t come at the expense of storage space. While it’s easy to bump into the storage ceiling of a 32GB, 64GB, or even a 128GB USB flash drive, you’ll find there’s much more breathing room when dealing with terabytes of space, which is what the T3 offers. Whereas the first generation T1 topped out at 1TB, Samsung was able to double the maximum capacity of the T3 and T5 to 2TB, a result of upgrading from 32 to 48 stacked layers of V-NAND flash memory cells for a denser configuration. What’s that, you're into skydiving and running with the bulls? If you’re a true adventurer, then it might not be speed, capacity, or value that top your list of priorities. What you need is a rugged drive, something that can survive horrifying levels of abuse—then this is the best rugged drive for you. There are a few different solutions, though one of the toughest USB flash drives out there is LaCie’s XtremKey. According to LaCie, you can run over this thing with a 10-ton truck without compromising your data. It can also withstand extreme temps from -50C to 200C, and it stays water tight when submerged up to 200 meters. It’s one thing for LaCie to say how durable its XtremKey is, but demonstrating it is another matter. Lest there be any doubt, LaCie posted a couple of YouTube videos showing its XtremKey being subjected to levels of abuse that would destroy any regular USB flash drive, such as being run over with a steamroller and dropped in a tank of liquid nitrogen. How did LaCie build such a rugged flash drive? The memory modules sit behind a 2mm Zamac metal alloy casing sealed with water-resistant screw threads and a hermetic, rubber O-ring. But it’s not just about physical protection, the XtremKey features AES 256-bit encryption and comes with backup software for Windows and Macs. We like WD’s My Passport. It’s not as compact and fast as Samsung’s T3, and it can’t withstand armageddon like LaCie’s XtremKey, but at up to 4TB for $120, it offers the copious storage space at a good value. We also like that WD (aka Western Digital) fares well each time cloud backup provider Backblaze releases a hard drive reliability report. The 4TB model measures 21.5mm x 81.5mm x 110mm (HxWxL) and weighs 250g. You probably wouldn’t want to try and jam one into a shirt pocket, but they’re about as portable as a smartphone, just a little chunkier. The 1TB Passport is slightly thinner and weighs 170g, if you don't need as much space. It is, undoubtedly, the minivan of external hard drives. No external power supply is needed to use WD’s drive—just plug in the USB cable and start backing up your files. You can also install WD’s backup software to automate the process. WD also goes the extra mile with password protection and hardware encryption. And if you’re looking to make a fashion statement, you can select a My Passport in a range of color options.